On Nov. 27, ANR is once again participating in #GivingTuesday—a 24-hour global giving challenge—a movement about ordinary people coming together to do extraordinary things. Celebrated on the Tuesday after Thanksgiving, #GivingTuesday kicks off the charitable season. For ANR, Giving Tuesday is an opportunity to raise funds for UC Cooperative Extension county programs, research and extension centers and statewide programs. To help Californians recover from recent wildfires, adapt to climate change and escape persistent pockets of poverty, the needs in the coming year will be great, and year-end giving is an opportunity for donors to assist. “UC Cooperative Extension professionals have a deep passion for their work and a dedication to the communities they serve. While most deliver their research and programs quietly every day, it is especially incredible to witness their response to disaster; for example, recent wildfires saw local UCCE offices responding immediately with vital information for coping with the fires, care for livestock and pets, as well as service in food banks and other volunteer needs,” said VP Glenda Humiston. UC Cooperative Extension staff and 4-H members took care of evacuated farm animals at the fairgrounds, and in Siskiyou County, partnered with local agencies to create and distribute Pet Emergency Evacuation Plan pamphlets. 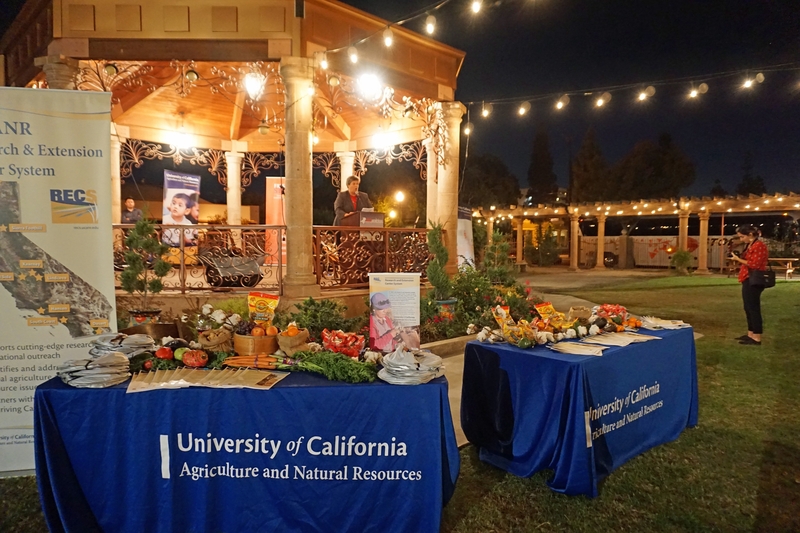 “Giving Tuesday gives us an opportunity to talk about our research and outreach to enhance food systems and create thriving communities, as well as all the other positive things everyone in ANR is doing to make life better for Californians,” Humiston said. 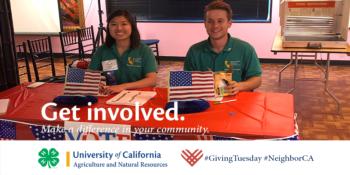 For UC ANR stakeholders, #GivingTuesday presents an opportunity to support the many programs and services that strengthen California communities each day and more importantly, during times of crisis. Last year, over $76,000 was raised on #GivingTuesday to support UC ANR programs including the 4-H Youth Development Program and UC Master Gardener Program. “As residents of California, we're all each other's neighbors—we lend a helping hand, we share information, we care about our community. That's what our #GivingTuesday #NeighborCA campaign is all about.” said Emily Delk, director of annual giving for UC ANR. “This year, I'm excited to share that we will have two match challenge funds. One supporting the California 4-H Foundation and one for all UC ANR.” said Delk. 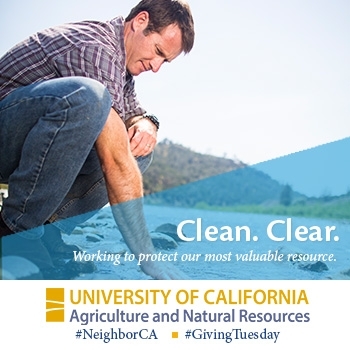 A website is up with links to all of ANR's programs, Research and Extension Centers and UCCE offices: ucanr.edu/givingtuesday. It invites donors to designate programs or locations to which they wish to donate. Templates for “unselfies.” Donors may take photos of themselves holding an unselfie sign and share on social media how they are giving. 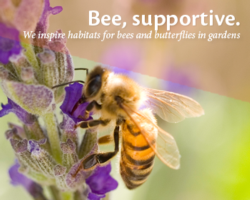 The UC Master Gardener Giving Tuesday website is at http://mg.ucanr.edu/givingtuesday. The 4-H Youth Development Program also has its own website at http://4h.ucanr.edu/GivingTuesday. Although not as well-known as the shopping events Black Friday and Cyber Monday, #GivingTuesday appeals to people who are swept up in the spirit of giving at the end of the year. This year Development Services has set a goal of collecting a total of $100,000 for 4-H and UC ANR from 300 or more donors on #GivingTuesday. Last year UC ANR and 4-H received nearly 300 gifts. “The #GivingTuesday #NeighborCA campaign is a fun way for people in all ANR programs to give to the programs most important to them,” said Delk. Michael Jones joined UCCE on Oct. 1, 2018, as the area forestry advisor in Mendocino, Lake and Sonoma counties. He specializes in forest entomology with a focus on forest health and integrated pest management of invasive and endemic forest pests. Jones completed a Ph.D. in entomology from State University of New York, College of Environmental Science and Forestry and a B.S. in environmental biology and management from UC Davis. Prior to joining UCCE, Jones was a graduate student and research project assistant at State University of New York. 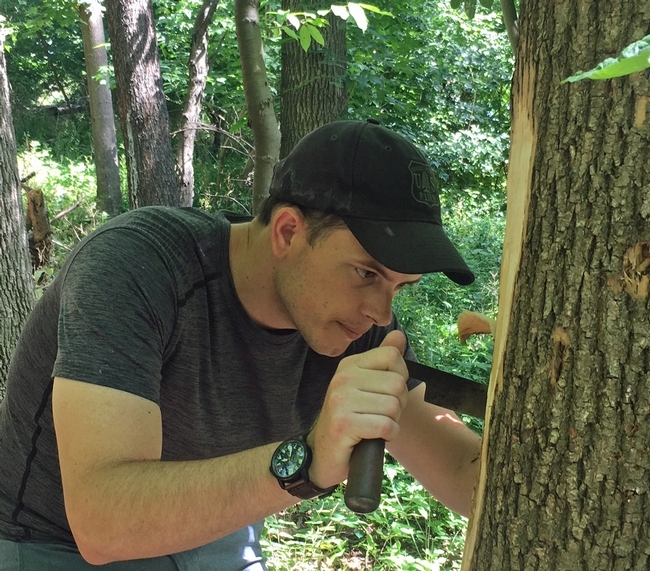 He developed and maintained research projects on delimitation, management, and biological control of the invasive forest pest emerald ash borer in New York. From 2010 to 2013, Jones was a research associate in the UC Davis Department of Entomology, in collaboration with the US Forest Service, Forest Health Protection in Southern California. He participated in a variety of forest pest research projects involving the detection, evaluation and management of endemic and invasive forest pests. He has been active in leading training activities for land managers and land owners in the field identification and management of forest pests, and training and supervising field crews in the collection of field data. As an undergraduate at UC Davis, he worked on sudden oak death with David Rizzo's lab group in the Department of Plant Pathology. 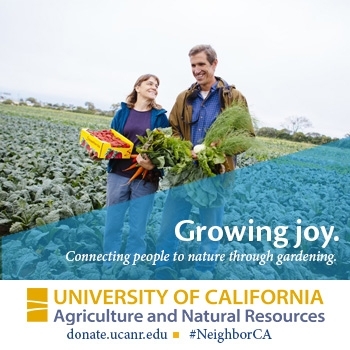 Based in Ukiah, Jones can be reached at (707) 463-4495 and mjones@ucanr.edu. 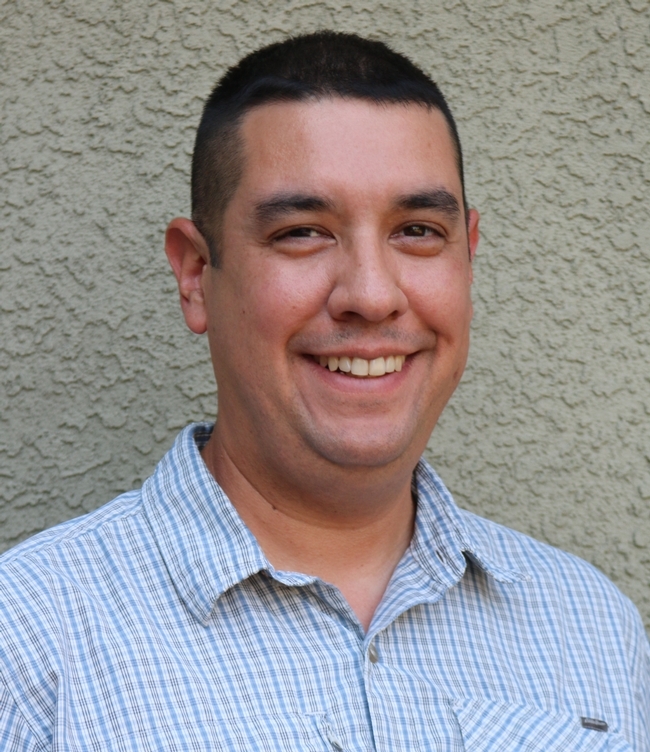 Daniel Sanchez joined UCCE on Sept. 1, 2018, as a UC Cooperative Extension specialist in woody biomass utilization in the Department of Environmental Science, Policy & Management at UC Berkeley. Sanchez is an engineer and energy systems analyst studying the commercialization and deployment of energy technologies that remove CO2 from the atmosphere. Sanchez's work and engagement spans the academic, nongovernmental, and governmental sectors. 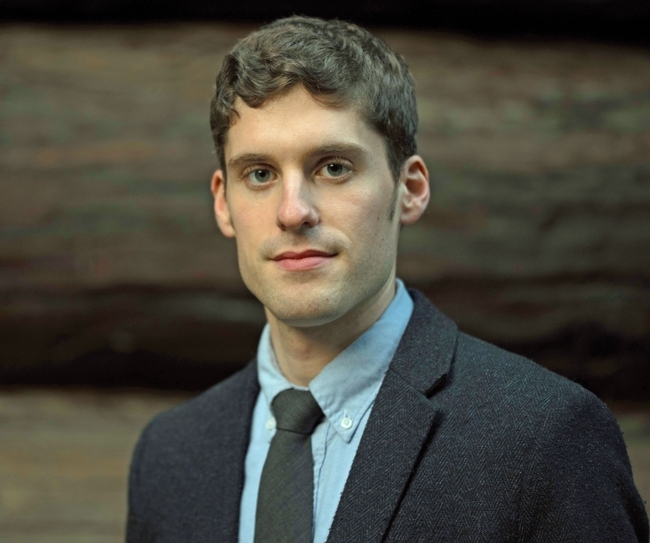 As an assistant Cooperative Extension specialist, he runs the Carbon Removal Lab, which aims to commercialize sustainable negative emissions technologies, and supports outreach to policymakers and technologists in California and across the United States. Sanchez earned a Ph.D. and a M.S. in energy and resources at UC Berkeley. He completed a B.S.E in chemical and biomolecular engineering at University of Pennsylvania. Prior to joining the faculty of UC Berkeley, Sanchez was a AAAS Congressional Science and Engineering Fellow serving in the Office of Senator Michael Bennet (D-CO). He has previously held positions with the Advanced Research Projects Agency-Energy, Green for All, and the California Public Utilities Commission. Sanchez is located in Mulford Hall and can be reached at (215) 593-4493 (cell) and sanchezd@berkeley.edu. Follow him on Twitter @Dan_L_Sanchez. Peter Larbi joined ANR on Aug. 13, 2018, as a UCCE area agricultural application engineering specialist at the Kearney Agricultural Research and Extension Center. Prior to joining ANR, Larbi had been an Assistant Professor of Agricultural Systems Technology in the College of Agriculture at Arkansas State University since 2014. He developed an integrated teaching and research program related to agricultural systems technology; developed and managed research in precision agriculture, agricultural machinery systems, remote sensing and sensor technology; and provided service to the university, college, local community and general scientific community. Larbi held a joint appointment in the Division of Agriculture at University of Arkansas. From 2012 to 2014, Larbi was a postdoctoral research associate at the Center for Precision and Automated Agricultural Systems at Washington State University. From 2011 to 2012, he was a postdoctoral researcher at the University of Florida Citrus Research and Education Center. Larbi can be reached at (559) 646-6577 and palarbi@ucanr.edu. Lysandra Pyle joined ANR on Aug. 15, 2018, as an assistant project scientist. Working closely with project directors at UC Sierra Foothill Research and Extension Center and Eastern Oregon Agricultural Research Center (EOARC), Pyle is leading a multistate research project investigating biotic and abiotic drivers of native grass recruitment on degraded intermountain rangeland and identifying potential management actions that can be used to improve large-scale restoration efforts. Most of her field work and project development is being done from EOARC, which is in close proximity to the Oregon and California intermountain field sites. Pyle completed a Ph.D. in rangeland and wildlife resources from University of Alberta, Canada, and a B.Sc. in biology from University of Regina, Canada. 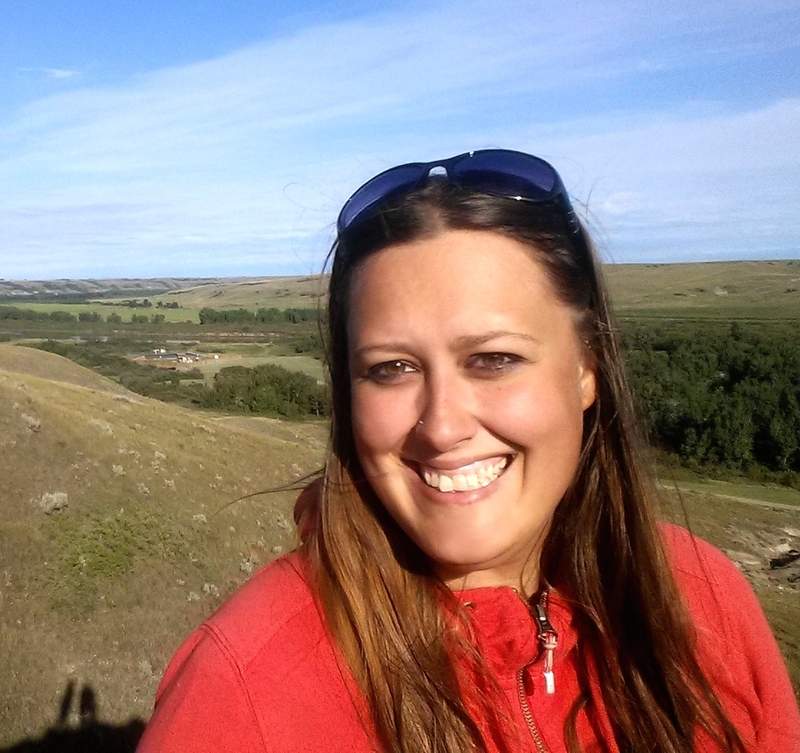 Prior to joining ANR, Pyle worked on contracts specializing in biodiversity monitoring and rangeland ecology while finishing a Ph.D. in rangeland and wildlife resources at the University of Alberta, conferred in April 2018. From November 2017 to March 2018, Pyle was a vascular plant technician with Alberta Biodiversity Monitoring Institute (ABMI) at the Royal Alberta Museum. There, she identified vascular plants collected by ABMI technicians during the field season and contributed to publications. Pyle also consulted as a plant community data analyst at Manitoba Forage and Grassland Association from January 2017 to March 2018, where she analyzed plant community data collected from the Aspen Parkland and Assiniboine Delta rangeland ecoregions, identified reference communities, and determined how they transition with disturbances such as grazing. Her Ph.D. characterized the composition and diversity of grassland seed banks in two main studies: identified the diverse disturbance legacies and management histories of pastures on plant communities, seed banks, soils, and rangeland health, and examined legacy effects of pipelines on seed banks and biological soil crusts in native mixed grass prairie. Pyle is based in Burns, Ore., and can be reached at (306) 551-1108 and lapyle@ucanr.edu. Follow her on Twitter at @GrasslandNerd. Nathaniel Caeton was promoted to 4-H youth development advisor for Shasta, Tehama and Trinity counties on Aug. 1, 2018. 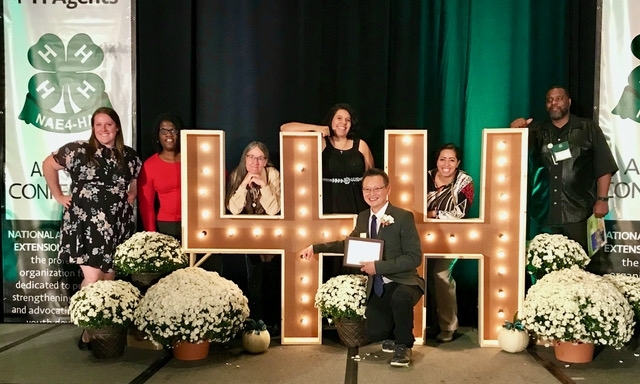 Prior to accepting his current position as 4-H youth development advisor, Caeton had served as the 4-H community education specialist since 2013. He was responsible for overseeing the daily operations of the 4-H Youth Development Program in Shasta and Trinity counties. During that time, he worked diligently to strengthen existing program relationships, while developing new relationships through outreach and collaboration. His master's work at CSU Monterey Bay combined multiple disciplines and built knowledge in the areas of learning theory, instructional design, instructional technology, interactive multimedia, assessment and evaluation. This enabled Caeton to plan, design, develop, implement and evaluate instructional programs. This work culminated in the creation of an electronic portfolio and capstone project, which involved the design and development of a one-hour e-learning module on diversity awareness for adult volunteers. He also actively volunteers with the Boy Scouts of America and the Civil Air Patrol. Caeton earned an M.S. in instructional science and technology from CSU Monterey Bay and a B.A. in social sciences from CSU Chico. Based in Redding, Caeton can be reached at (530) 224-4900 and nwcaeton@ucanr.edu. Richard Mahacek, UC Cooperative Extension 4-H youth development advisor in Merced County from 1976 to 2012, was inducted into the National 4-H Hall of Fame on Oct. 19 for his lifetime achievements and contributions to 4-H.
Mahacek was one of 15 people inducted during the ceremony at the National 4-H Youth Conference Center in Chevy Chase, Md. Mahacek joined a 4-H Club in Sonoma County when he was 10. 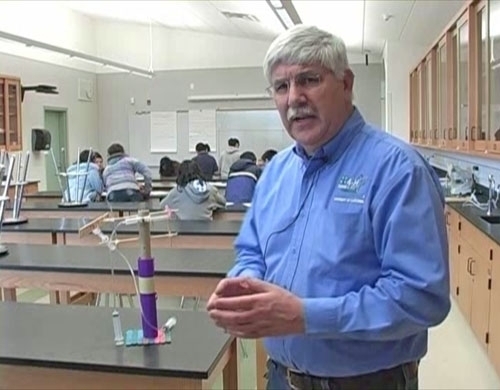 During his 35-year 4-H career, Mahacek placed an emphasis on mechanical sciences and engineering projects. His work included development of curricula and activities in science processes, robotics, computers, GIS/GPS, bio-security and environmental issues, such as watersheds and wildlife habitats. In 1988, Mahacek was a member of the team that developed the 4-H SERIES (Science Experiences and Resources for Informal Educational Settings) curriculum, which was funded by the National Science Foundation and Kellogg. SERIES was the first comprehensive pragmatic science education curriculum to join 4-H's traditional projects. In 2004, Mahacek served on the national leadership team for 4-H SET (Science, Engineering and Technology), a program that succeeded SERIES. Now known as STEM (Science, Engineering, Technology and Math), the project aims to enhance young people's interest in developing the knowledge and skills needed for the 21st century's technically oriented careers. The crowning achievement of his career was the development of the 4-H Junk Drawer Robotics curriculum in 2011. The curriculum shows how to engage children in building robotic devices with rubber bands, Popsicle sticks, medicine dispensers and bamboo skewers – the kinds of things people already have around the house. The robotics program develops skills that go beyond science and engineering. The children learn communications, teamwork and critical thinking. Junk drawer robotics is one part of a three-track robotics curriculum. The other tracks are virtual robotics, in which participants build virtual robots on computers, and robotics platforms, which employs commercial robot building kits for materials. The package of robotics programs was the No. 1 selling 4-H curriculum in the nation in 2011. Mahacek was also a driving force in the community in founding the UC Merced Engineering Service Learning Program Castle Science and Technology Center. This facility used a former US Air Force facility to provide hands-on science experiences to the youth of the county. Mahacek received many honors for his contributions to 4-H and UC Cooperative Extension. In 1988, he received distinguished service awards from the state and national 4-H associations. The Merced County Farm City Ag Business Committee presented him its Agri-Education Award in 1992. Mahacek received the “Hands-On Heroes Award” at the Merced County Children's Summit. Mahacek said the 4-H program has evolved during his tenure, but it has not changed its core objectives. The National 4-H Hall of Fame honorees are nominated by their home states, National 4-H Council, the National Association of Extension 4-H Agents or 4-H National Headquarters/National Institute of Food and Agriculture based upon their exceptional leadership at the local, state, national and international levels. 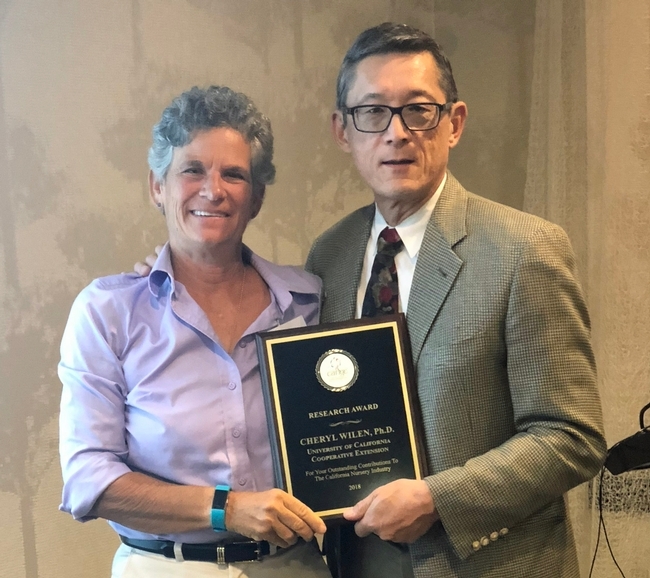 Cheryl Wilen, left, receives award from Loren Oki. Cheryl Wilen, area IPM advisor based in San Diego County, was presented the Research Award by the California Association of Nurseries and Garden Centers (CANGC) for her contributions to the nursery industry at the CANGC Convention in San Diego on Oct. 10, 2018. “This award acknowledges Dr. Wilen's many significant contributions over her career that have benefited the California nursery and landscape industry,” said Loren Oki, UCCE environmental horticulture specialist in the Department of Plant Sciences at UC Davis and co-director of UC's Nursery & Floriculture Alliance, who presented the award to Wilen. Wilen specializes in Integrated Pest Management (IPM) for ornamental plant production and maintenance in nurseries, greenhouses, field production, floriculture, turf and landscape, which has resulted in the use of pesticides in a more prescriptive manner and the development of alternative strategies to more efficiently control pests of ornamental plants. Although her primary research focus is the management of weeds, snails and slugs, her other areas of research include the Asian citrus psyllid, disease management in floricultural crops, nematode management in tomatoes, invertebrate pest management in nurseries, vertebrate pest management, mitigating pesticide contamination in surface water runoff, and soil solarization. Wilen also recently received the UC ANR Distinguished Service Award for leadership. She has served ANR as the acting and interim director of the Statewide UC IPM Program, leader of the Endemic and Invasive Pest and Disease Strategic Initiative, member of Program Council, organizer of the Pest Management Coordination Conference, chair of several UC ANR search committees, and chair and member of the South Coast Research and Extension Center Research Advisory Committee. Her current and previous professional service includes chair of the Basic Science Section Western Society of Weed Science, chair of Teaching and Technology Transfer Section Weed Science Society of America, chair or co-chair of meetings of professional organizations including the California Weed Science Society, and has served or is currently serving as a member of various committees of the Weed Science Society of America, Southern California Chapter of the California Association of Pest Control Advisers, Steering Committee of the 2015 International IPM Symposium, and the CANGC Research Advisory Committee. The CANGC Research Award recipient is selected by their peers and colleagues from industry and academic community. 4-H staff from left, Dagmar Derrickson, Tamekia Wilkins, Marianne Bird, Claudia Diaz Carrasco, Charles Go, Lilliana Vega and Keith Nathaniel. Katherine Soule, UC Cooperative Extension director and youth, families and communities advisor for San Luis Obispo and Santa Barbara counties, and community educators Janelle Hansen, Andrea Hollister, Laura Pena, Dagmar Derickson, Shannon Klisch, Melissa LaFreniere, Yezenia Romero, Yudilia Tomsen, Miguel Diaz, Betsy Plascencia, JaNessa Willis and Lisa Paniagua won the Excellence in Healthy Living Programming Award for the Western Region. The team also won the NAE4-HA Excellence in Healthy Living Programming for California. The Excellence in Healthy Living Programming Award recognizes outstanding efforts and impacts of NAE4-HA members in healthy living programming, evaluation, and/or research projects. JoLynn Miller, UC Cooperative Extension 4-H youth development advisor for the Central Sierra, won Excellence in 4-H Volunteerism Award for the North Central Region. Miller was part of a team with members from the North Central Region that created the National 4-H Volunteer E-Forum. The purpose of the 4-H Military Partnership Award is to recognize the individual or team who has created a positive Extension image through his/her/their leadership and citizenship as it relates to the development of the 4-H Military Partnerships on U.S. Army, U.S. Air Force, and/or U.S. Navy installations and in the community as it pertains to Reserve Component service members and families. John Borba, 4-H youth development advisor for Kern County, was honored with the 25 Years of Service Award, Steven Worker, 4-H youth development advisor for Marin, Sonoma and Napa counties received the Meritorious Service Award for service in 4-H programs for 15+ years. Charles Go, UC Cooperative Extension 4-H youth development advisor for Alameda and Contra Costa counties, received the Distinguished Service Award for more than 7 years of service. Go also has begun serving as western regional director on the NAE4-HA Board. Soule received the Achievement in Service Award for 3 to 6 years of service in 4-H programs. They received the awards Oct. 10 at the National Association of Extension 4-H Agents conference in Columbus, Ohio. 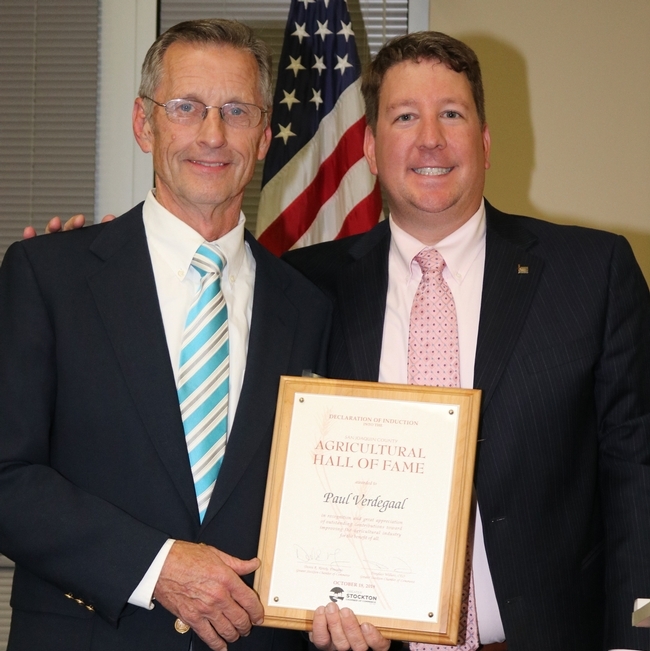 Paul Verdegaal, left, is presented with Ag Hall of Fame award by Stockton Chamber of Commerce Special Events Director/Leadership Stockton Director Timm Quinn. Paul Verdegaal, who retired after serving more than 30 years as UC Cooperative Extension viticulture advisor in San Joaquin County, was inducted into the San Joaquin County Agricultural Hall of Fame on Oct. 18. Donald Rough, who was a UCCE pomology advisor, will be inducted posthumously. “Verdegaal helped remove the stigma that Lodi could not grow premium wine grapes through exhaustive research, leadership and work with growers,” wrote Bob Highfill, marketing and communications manager for the Lodi Winegrape Commission, in the Stockton Record. John Kabashima, right, receives Urban Tree Legacy Award. 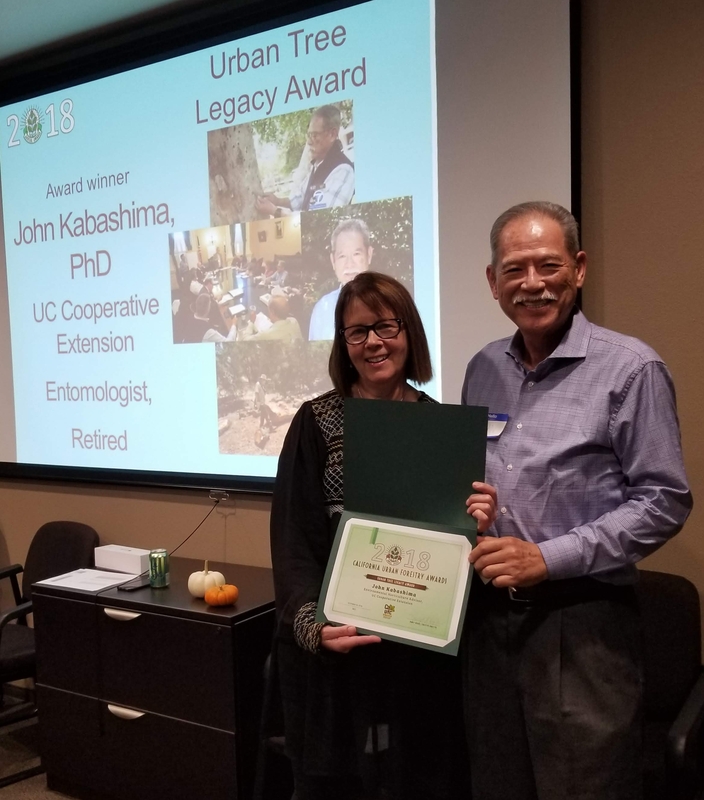 John Kabashima, UCCE environmental horticulture advisor emeritus, received the Urban Tree Legacy Award by the California Urban Forests Council and the San Diego Regional Urban Forests Council at a ceremony in San Diego on Oct. 26. Kabashima's varied research and extension programs have included the management of insects, diseases, and biological control of exotic and invasive pests. Kabashima, who retired in 2015 after 28 years of serving the nursery and landscape industry and homeowners in Orange and Los Angeles counties, continues to lead the battle against invasive shot hole borer pests that spread fusarium dieback, threatening trees in Southern California. On Oct. 3, Kabashima gave a presentation at an urban forest summit for public agencies, reviewing current pest concerns relating to trees for San Diego County and what the county needs to do to defend against future invasions. He has provided testimony for the California Legislature to fund further research into these destructive pests. 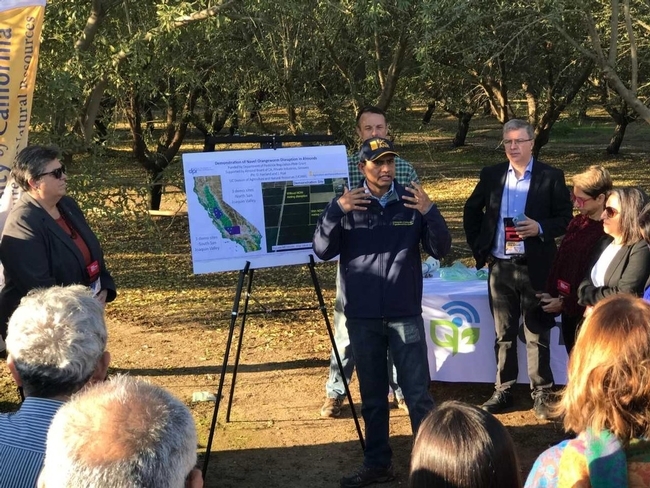 In January, Kabashima was instrumental in bringing together university scientists, federal and state government representatives, county agricultural commissioners and nonprofit organization leaders for a summit in the state capitol to coordinate their efforts to battle invasive pests. Kabashima received his bachelor's degree in agricultural biology from Cal Poly Pomona, master's degree in pest management from UC Riverside, an MBA from Pepperdine University and a doctorate in Entomology from UC Riverside. In 2014, he was inducted into the Green Industry Hall of Fame, and in 2016 he received the Arboriculture Research Award from the Western Chapter of the International Society of Arboriculture. UC scientists, students and water agency professionals took a critical look inwards and a radical look outwards when they gathered in Sacramento in October to reimagine California water. 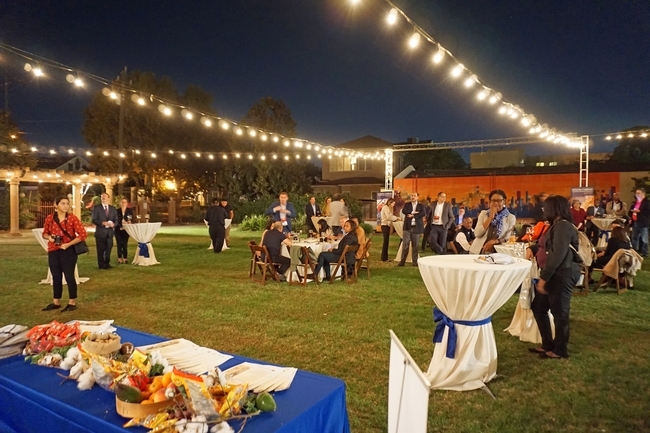 The event was the fourth annual gathering sponsored by UC ANR's California Institute for Water Resources and the University of California Water Security and Sustainability Research Initiative, UC Water. While science is the hallmark of a research-oriented institution like UC, the participants were asked to recognize their important role not just as scientists but also communicators. “Complexity can lose people easily,” she said. The conference keynote speaker, futurist Kim Stanley Robinson, also addressed the divide between scientific discourse and popular understanding, in particular when speaking about climate change. California water travels from the high-mountain headwaters of the Sierra Nevada to the vast groundwater basins in the valleys below. 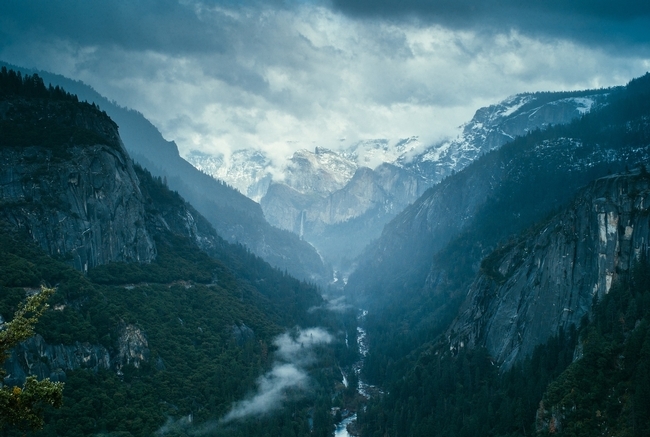 The Reimagining California Water Conference pursued the water journey from the high-mountain headwaters of the Sierra Nevada to the vast groundwater basins in the valleys below. Over the last century, the mountains were blanketed with snow each winter, storing water that melted slowly in the spring and summer to provide a reliable source of water for farming and communities below. However, climate change is telling a new tale. Warmer weather means less snow and more rain will fall on the mountains during the winter. The quick runoff must be managed in a way that preserves it for use in the summer. “We need groundwater recharge because we're losing the snow pack quicker than we thought we would,” Bales said. The new California water narrative has prompted scientists and policymakers to take a serious look at the potential for “flood-managed aquifer recharge” or Flood-MAR. Flood-MAR is a management strategy that uses water from rain or snowmelt to flood agricultural lands and working landscapes, such as refuges, floodplains and flood bypasses. Successful implementation of Flood-MAR requires the identification of land for groundwater recharge, understanding the economic and agronomic impact of using agricultural land for recharge, and impacts of high-volume recharge on groundwater quality. But the potential is enormous. Though the enormity of rewriting the California water story might seem an insurmountable challenge, panelist Debbie Franco noted that the passage of Sustainable Groundwater Management in 2014 happened when the state's unsustainable reliance of groundwater spiked during the 2011-2016 drought, reducing municipal water quality, drying domestic wells and causing land to sink. Glenda Humiston addresses the ACE 10 participants at a dinner Oct. 24 in the plaza at Arte Americas museum in Fresno. Vice President Glenda Humiston hosted 50 high-level representatives from 24 countries as part of the Tenth Americas Competitiveness Exchange (ACE 10) on Innovation and Entrepreneurship tour of Northern California Oct. 21-27. Over the course of a week, ACE 10 participants visited innovation clusters in San Francisco, Salinas, Santa Cruz, Monterey, Fresno, Davis and Sacramento. UC Cooperative Extension advisors David Haviland and Jhalendra Rijal and Sebastian Silva of ag tech company Semios talked to the international delegates about almond research and how UCCE works with growers and companies. Later, an entrepreneur told AVP Wendy Powers that he was beginning to think about how to develop a university-based Extension system in Grenada, how to convince his government to redirect funds from federal agencies to the university. Jhalendra Rijal, UCCE IPM advisor, describes research on mating disruption to control navel orangeworm in nut crops. Tour co-sponsor Valley Vision's Tammy Cronin described activities during the ACE 10 visit to Sacramento in a blog post. The ACE program is coordinated by the U.S. Department of Commerce's International Trade Administration and Economic Development Administration in coordination with the U.S. Department of State and the Organization of American States. It brings together decision-makers from around the world to explore global and regional partnerships, and economic development opportunities to establish new global commercial relationships. EDA and OAS posted daily updates about the tour on Facebook and Twitter with the hashtag #ACXchange. ACE 10 participants enjoy a strolling dinner in the plaza at Arte Americas in Fresno.